Angiosarcomas are uncommon malignant tumors that arise from vascular endothelial cells with poor prognosis. Stewart–Treves syndrome (STS) is a type of cutaneous angiosarcoma that develops in chronic lymphedema. Although the majority of lymphangiosarcomas arise from areas of lymphedema as a consequence of lymph node dissection in radical mastectomy, it has also occurred in other causes of lymphedema. In the pathophysiology of lymphangiosarcoma, impairment of the local immune response and induced angiogenesis are emphasized. A 69-year-old male patient with a previous diagnosis of chronic lymphedema in his left lower limb presented with STS and widespread metastases. The patient refused the treatment for lymphedema and ignored the lesion due to its innocuous appearance. In addition, during the presentation, he had Stage 4 disease and, therefore, he was not a candidate for curative operative treatment. Early tumor resection or limb amputation has the best outcomes in the treatment. Stewart–Treves syndrome (STS) is a type of cutaneous angiosarcoma that develops in the setting of chronic lymphedema. Although it was first described as an angiosarcoma that arose from areas of lymphedema as a consequence of lymph node dissection in radical mastectomy, it also occurs in congenital, filariasis, and idiopathic lymphedema, among other causes of lymphedema. It is a very rare syndrome, with over 400 reported cases in the world, 90% of which are in the upper limb due to lymphedema subsequent to breast cancer treatment. We present an extremely rare, metastatic case of STS in the lower limb in a patient with chronic idiopathic lymphedema. 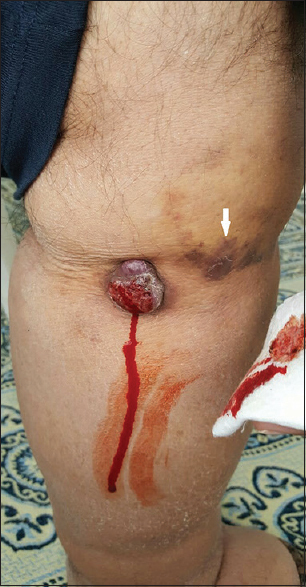 A 69-year-old male patient with an ulcerated reddish-purple mass, which had a satellite lesion in the anterior upper third of his left leg, presented to our outpatient clinic for an evaluation of therapeutic options, including resection. He was initially diagnosed with idiopathic lymphedema in the left lower limb at the age of 48 but refused treatment. Five months ago, he had noticed a rapidly growing, ulcerated, small, purple-reddish lesion that he initially considered a bruise. For this reason, he admitted to the hospital after the lesion started to bleed spontaneously [Figure 1]. He was misdiagnosed as hemangioma in another clinic and was referred to us for tumor resection. An excisional biopsy was performed with safe surgical margins. The skin defect was covered with a split-thickness skin graft (STSG). The pathology result indicated an angiosarcoma with positive surgical margins. Immunohistostaining demonstrated strong positivity for endothelial markers, such as CD31 (cluster of differentiation 31), CD34, vimentin, and factor-VIII-related antigen, confirming the diagnosis of angiosarcoma in the chronic lymphedema site which is called STS. Strong Ki-67 expression was also observed in our case [Figure 2]. 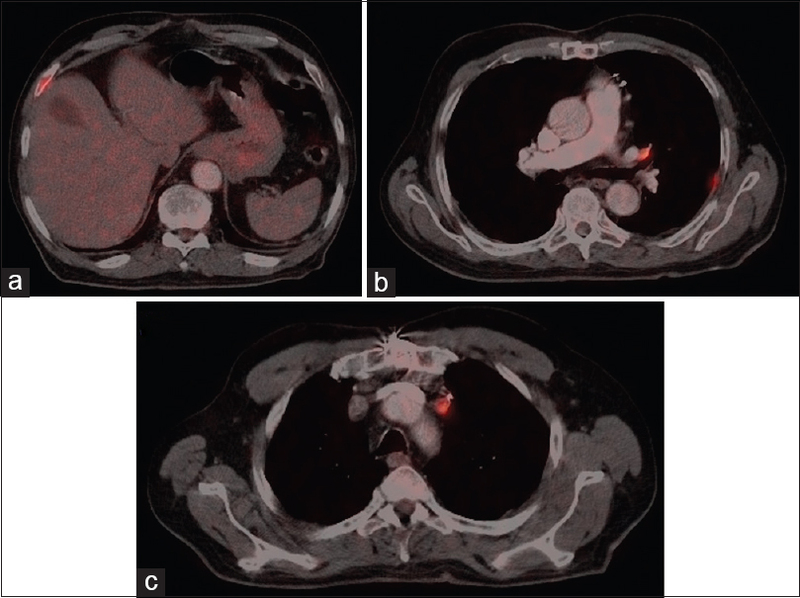 Positron emission tomography/computed tomography (PET/CT) scanning showed distant metastases to the mediastinal lymph nodes, vertebral column, the right seventh rib, and pleura [Figure 3]. A few weeks later, the patient presented with graft failure and five scattered nodules around the previously resected lesion, showing rapid progression of the disease [Figure 4]. The tumor was inoperable due to the widespread metastases and locally progressed tumor, which was very close to the anterior tibial artery. He was referred to the oncology department for chemotherapy after a successful STSG. Monotherapy with paclitaxel was started for the patient. Fourteen months after the appearance of the tumor, the patient's general medical condition had deteriorated. The widespread metastases and tumor in his left leg did not regress. At the time of writing this manuscript, the patient's medication was changed to vinorelbine. Angiosarcoma is diagnosed through biopsy and immunohistostaining for endothelial markers, such as CD31, CD34, and factor VIII. The best marker (due to its high sensitivity and specificity) is CD31. PET/CT, magnetic resonance imaging, and CT scanning should be performed after the diagnosis to detect metastases, assess the local extent of the tumor, and decide on a treatment modality. Angiosarcoma can be misdiagnosed as a bruise, hemangioma, or even decubit ulcer, especially if the physician is not familiar with the disease because of its infrequent occurrence. The treatment choices are surgery, chemotherapy, and radiotherapy. The authors suggest an incisional biopsy if there is suspicion and that the physician requests the needed imaging methods for evaluation of the treatment. The curative treatment for the local tumor is total excision or limb amputation in locally advanced tumors (forequarter amputation or shoulder disarticulation in the upper extremity and through hip amputation or trans-hemipelvectomy in the lower extremity). After local excision of the tumor, recurrence is frequent. In metastatic tumors, the treatment of choice is chemotherapy or radiation therapy, although the outcomes are poor. Overall, radical surgery has the best results for this rare disease. Chemotherapy can prolong survival if the initial response to the first treatment course is successful. In our case, the patient was misdiagnosed with hemangioma; for this reason, we preferred an excisional biopsy. Since the tumor was locally advanced and there were distant metastases, complete resection or other surgical options, such as limb amputation, were not possible. Woodward et al. reviewed 186 cases of STS from the literature and Mayo Clinic. Overall, 162 of the cases were postmastectomy lymphedema telus lymphangiosarcoma and the malignancy occurred an average of 10 years and 3 months after mastectomy. In 24 cases of mastectomy not related to STS, the average duration between the onset of lymphedema and the STSs lesions was reported to be 19 years and 10 months and ranged from 6 months to 46 years. In our case, the latency period was 21 years, which corresponds to the cited publications above. In STS, patient survival ranges from 19 to 31 months from diagnosis, with a high rate of local recurrence and distant metastases., Five-year survival rates are between 10% and 35%., Without treatment, patients generally live 5–8 months after diagnosis. Due to STSs bad prognosis, prevention and early diagnosis of angiosarcoma in chronic lymphedema are crucial. Early tumor resection or limb amputation has the best outcomes. Since cutaneous angiosarcomas can be misdiagnosed with other pathologies, physicians should be careful about any skin lesion in limbs with chronic lymphedema despite their innocent appearance. Routine follow-up examinations for patients with chronic lymphedema and different treatment alternatives, such as compression therapy, physiotherapy, weight loss, and surgery, are essential to prevention. Stewart FW, Treves N. Lymphangiosarcoma in postmastectomy lymphedema; a report of six cases in elephantiasis Chirurgica. Cancer 1948;1:64-81. Woodward AH, Ivins JC, Soule EH. Lymphangiosarcoma arising in chronic lymphedematous extremities. Cancer 1972;30:562-72. Ruocco V, Schwartz RA, Ruocco E. Lymphedema: An immunologically vulnerable site for development of neoplasms. J Am Acad Dermatol 2002;47:124-7. Schreiber H, Barry FM, Russell WC, Macon WL 4th, Ponsky JL, Pories WJ, et al. Stewart-Treves syndrome. A lethal complication of postmastectomy lymphedema and regional immune deficiency. Arch Surg 1979;114:82-5. Benmansour A, Laanaz S, Bougtab A. Stewart-Treves syndrome: A case report. Pan Afr Med J 2014;19:2. Cui L, Zhang J, Zhang X, Chang H, Qu C, Zhang J, et al. Angiosarcoma (Stewart-Treves syndrome) in postmastectomy patients: Report of 10 cases and review of literature. Int J Clin Exp Pathol 2015;8:11108-15. Sharma A, Schwartz RA. Stewart-Treves syndrome: Pathogenesis and management. J Am Acad Dermatol 2012;67:1342-8. Wierzbicka-Hainaut E, Guillet G. Stewart-Treves syndrome (angiosarcoma on lyphoedema): A rare complication of lymphoedema. Presse Med 2010;39:1305-8. Calonje E, MacKie RM. Soft-tissue tumours and tumour-like conditions. In: Burns T, Reathnach S, Cox N, Griffiths C, editors. Text Book of Dermatology. 7th ed. Oxford: Blackwell Science 2004;53:28-9. Komorowski AL, Wysocki WM, Mitus J. Stewart-Treves syndrome. Pol Merkuriusz Lek 2004;16:493-4.